The South Korean government's effort to build a new international airport on Jeju Island has been making little headway in the face of stubborn resistance from residents and environmental activists. 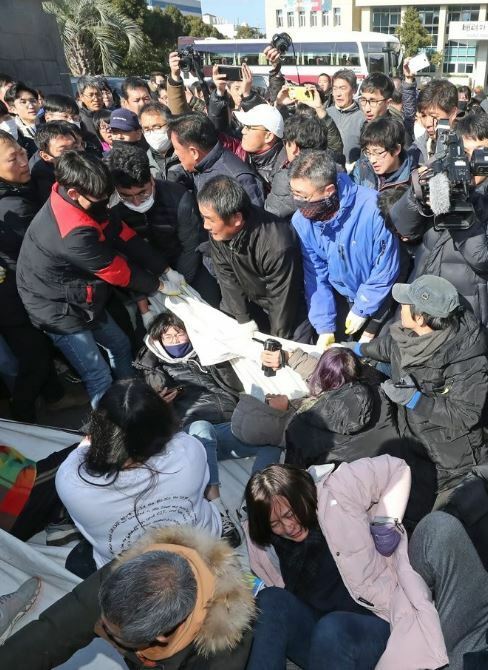 A Jeju resident continued his hunger strike for the 31st consecutive day on Friday in front of the Jeju provincial government office to protest the new airport project, while a number of civic activists have intermittently joined him in the prolonged demonstration. The conflict dates back to November 2015, when the Ministry of Land, Infrastructure and Transport announced the selection of a 5 million-square-meter lot in Seongsan, a rural area on the eastern tip of the resort island, as a candidate site for its second international airport. The ministry said the new airport will be built at a cost of 4.87 trillion won ($4.34 billion) by 2025 to handle 25 million passengers annually. The decision was reached as the existing international airport in the city of Jeju reaches saturation due to rapid increases in domestic and foreign tourists. The annual number of aircraft takeoffs and landings at Jeju International Airport, the gateway to the nation's top holiday destination, reached 167,000 in 2017 and 154,000 last year, compared with its capacity of 172,000. Its passenger terminal users numbered 29.6 million in 2017 and 27.2 million in 2018, far above the 25.91 million annual passengers it was built for. Flight delays have now become a daily routine at the Jeju airport as its runway capacity approaches its limit. Contrary to government expectations, however, many Jeju residents and civic groups have come out against the new airport project, citing its negative impact on the island's pristine environment. The opponents have raised questions over the ministry's feasibility study of the Seongsan site and demanded a review. They have also contended that a lava tunnel was found near the second airport site and warned that land degradation could occur in the area due to soil erosion. Then the ministry began a review of its feasibility study in December 2017, which concluded last month that there were no problems with it, sparking a wave of protests from residents and activists.